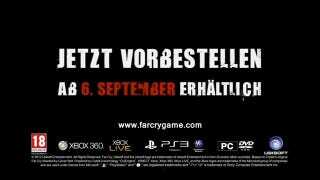 A leaked German Far Cry 3 dates the game for a Sept. 6 release. The trailer is CG and a longer version of a previously released teaser. If real, it's unclear whether the release is worldwide or Europe-only. Kotaku is following up to confirm with Ubisoft. Watch the full trailer in the link below and read Kotaku's Far Cry 3 impressions here.